This post is long overdue, but I owe it to the moms: expecting, new and current; as it’s a recurring question and topic that I get asked about often. Those that drive regularly, have a slight advantage since a lot of these items can be kept perfectly organized in your car and out of your bag; but with how unpredictable newborns can be, you’re kind of still stuck toting a lot. For those urbanites who don't drive, are heavily on foot or in and out of Ubers and public transportation (helloooo NY'ers!) then make sure you have an awesome stroller basket or the ability to bear an extra 10 lbs when out with baby...even if just for the most casual of neighborhood strolls! As for the light at the end of the tunnel: the need for carrying baby/toddler goods and hefty lugging does in fact regress with age. As does the labor, since eventually our children will get old enough to tote around their own belongings. However as we are in the time of still being bag ladies (and men), there are ways to make the best of it! Depending on what bag I'm using, I may or may not use the diaper clutch now. As your tot gets older, so will their bladder control, and you will no longer be changing a diaper every two hours. That said, we still pack his diapers but instead of four we only tote around three. We still take around the diaper cream, travel wipes, sanitizer and BabyBum Brush. We no longer pack any bottles for milk. We now use an insulated Pura Kiki bottle to carry water. We still carry our zippered mesh pouch with our goodies sans the nasal aspirator. However, now in full-blown toddler phase we added: band-aids, first-aid ointment, and seasonal items such as sunblock or bug repellent. Our toys to carry are now: 2-3 Wooden Toys, 1-2 Mini Board Books. We still carry an extra change of clothes and our OXO Tot Roll Up Bib, but now our toddler dines with stainless steel utensils so we carry OXO Tot On-The-Go Travel Utensils. And, while dining is a topic - the need to always have snacks on hand has become a must so in addition to the ready items like pouches/crackers/cereal etc (we stopped consumption of puffs a 12 months), we also usually carry either a stainless steel bento box or a Stasher silicone bag full of foods. 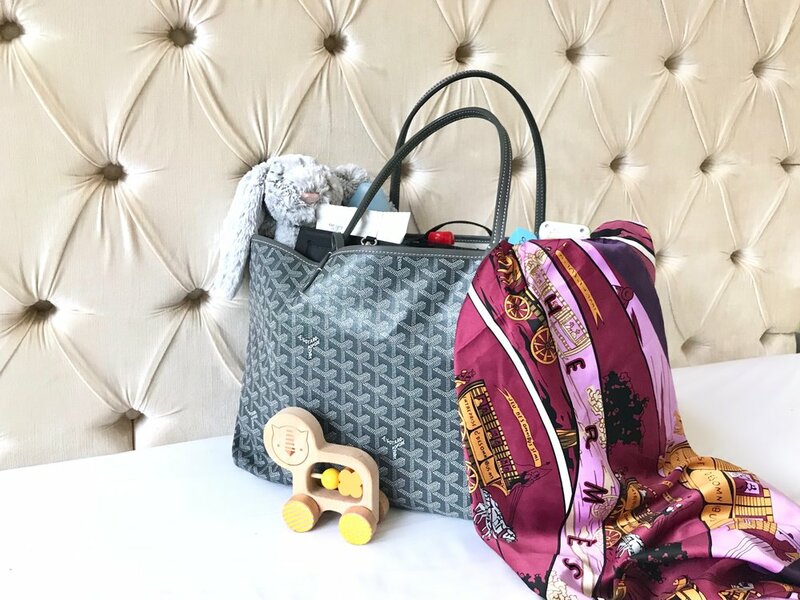 And finally, for the crowd that wants to skip the “diaper bag” purchase all together and rather make use of their existing bags instead, here’s my number one hack and solution that some may or may not know about - the ToteSavvy designed by Life In Play! 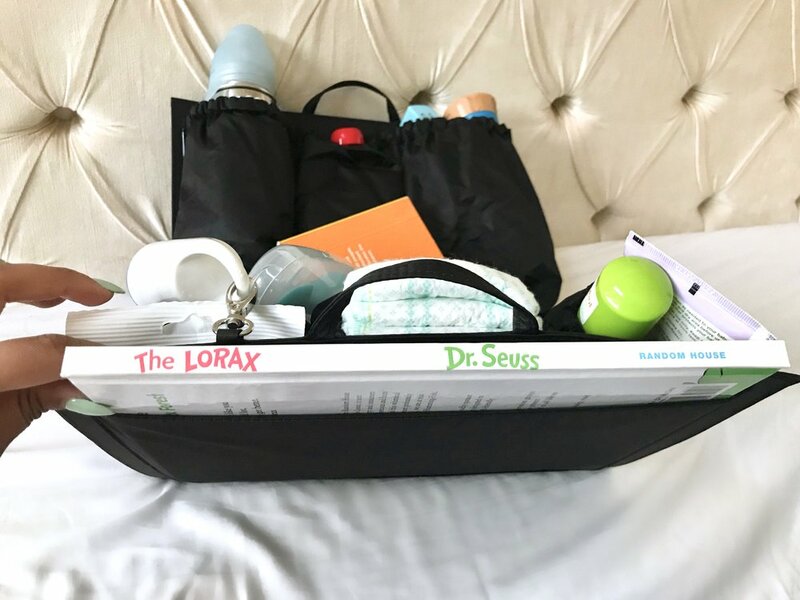 ToteSavvy is a genius compartment organizer that is designed to store every one of your diaper bag essentials in the most clever of ways. 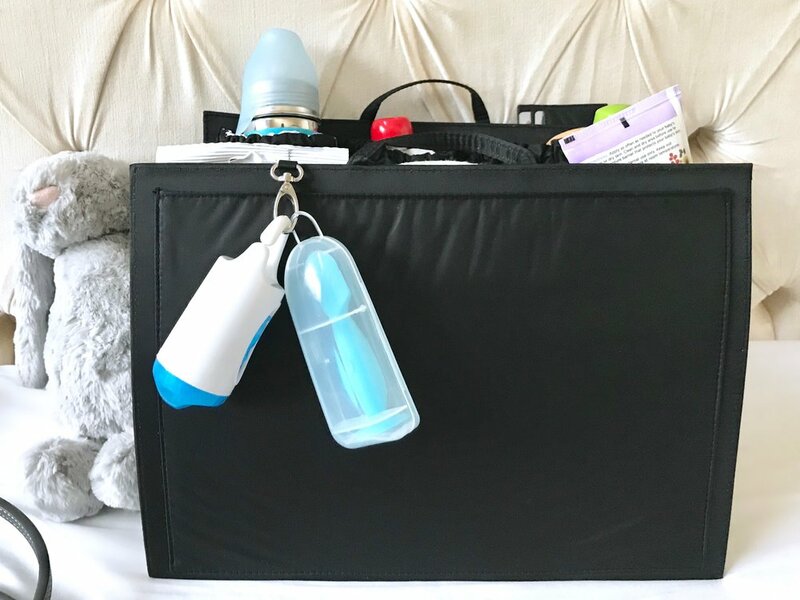 The organizer then can be carried into and out of any bag, tote or backpack; instantly transforming your existing bag into an organized diaper bag, letting you not miss a beat and pack all you need for your little one! The original (seen here) is in no way shy of space. 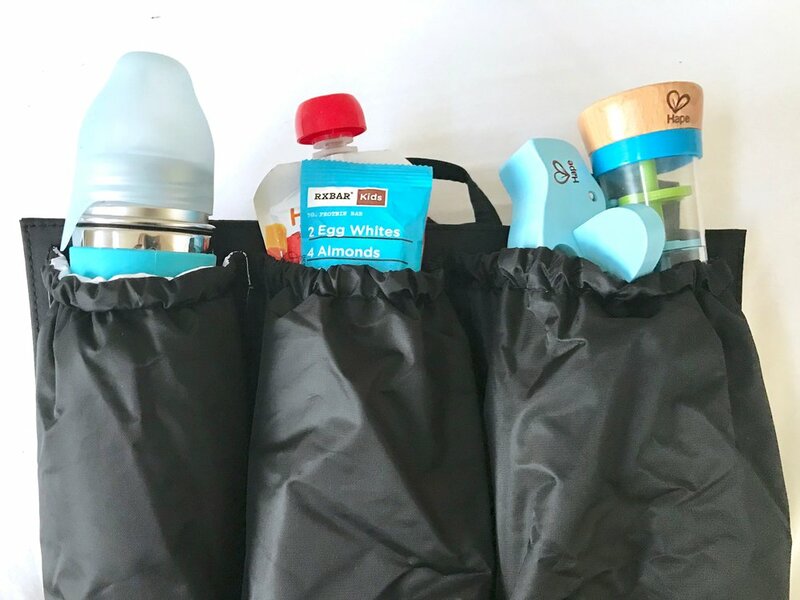 It comes in various colors to match different bag interiors and packs an insulated pocket for bottles and cold/hot food containers, several large pockets for things like toys, diapers, and anything else you can think of. There’s a clasp for keys and other hanging items. A pocket for your phone. It comes with a changing pad. There’s a flat pocket for things like documents. And there’s a larger pocket to pack soiled items or a spare change of clothes. In addition to the original, there’s also the ToteSavvy Mini as well for medium and smaller purses and even smaller backpacks. What I love most about the ToteSavvy the most as that once it’s packed with what you need, that’s it. It has two handles where you can effortlessly just pop it in and out of any bag and voila - you’re always good to go! In mine I have everything I need for @littlemrgray. Snacks. Toys. Diapers. Sanitizer. Bottle. Books. Extra Clothes. All of our liquid goodies and more. So let the ToteSavvy be your stylish hack for doing away with ugly diaper bags! It's only $74.99 - cheaper than a lot of diaper bags on the market - and I promise, worth every penny!